This is a little tip I actually picked up after Animation Mentor but regularly use now, it simply allows you to retime your video reference using Maya’s Graph Editor. I’m not sure how mentors teach this, so thought I’d type it up and share. Here I’ve gone through and imported an image sequence onto an image plane, with an offset of -100 frames to match my starting frame for the shot. You’ll notice the Image Number is a purple colour, meaning it’s being controlled by an expression. My first frame for this shot is 101, and this value is also 101. My last frame is 224 and this value is also on 224, the frame number you’re currently on is in direct correlation the the number contained in this box. This will set the value back to 1 and as the name implies, deletes the expression which was controlling the playback of the image sequence. Now I can go to frame 101, type 101 into this box, right click on it and set a key. Then I can also key 224 into the final frame. I’ve essentially re-entered the numbers that were already there. This time the numbers are being controlled by my keys, not an expression. You can visually see the difference now the box is red. The beauty now is if I open my graph editor, I can now see a curve representing the playback of my image sequence. If I set it to linear instead of the spline tangent above, it will play back at 1:1, as it did before. But now within the graph editor I can add keys and slow sections down, speed others up, etc. I can retime my whole video reference or just sections I’d like. 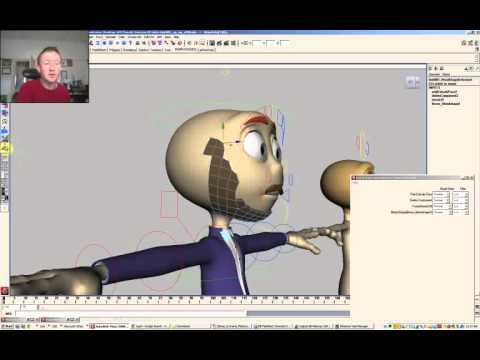 This is great if you have video reference and an audio track you’d like to match actions more closely to, if you find your acting is a little too even and would like to add a bit extra texture in the timing before blocking or if you want to do some cartoony actions with timing that is not entirely based on reality. 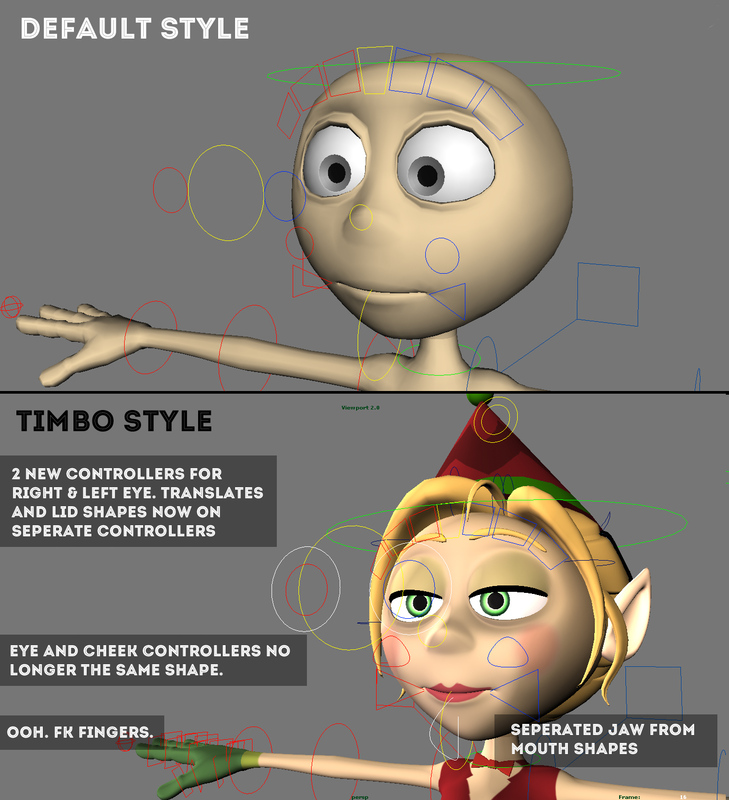 This entry was posted in Maya tips on October 17, 2017 by Tim. Often when animating things like lip sync, eyes or fingers I’d like to get a closer view of those body parts from the angle of my shot cam. 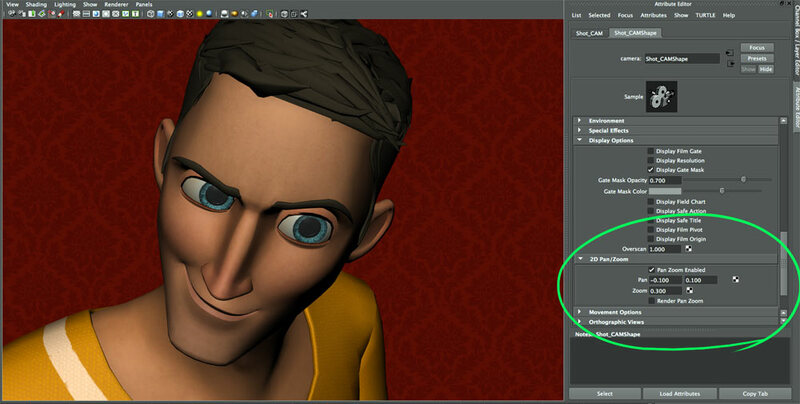 Maya has a simple function that will allow you to zoom in, without actually changing your camera set up. First, enable the 2D Pan/Zoom in your Viewport (the icon with the magnifying glass). 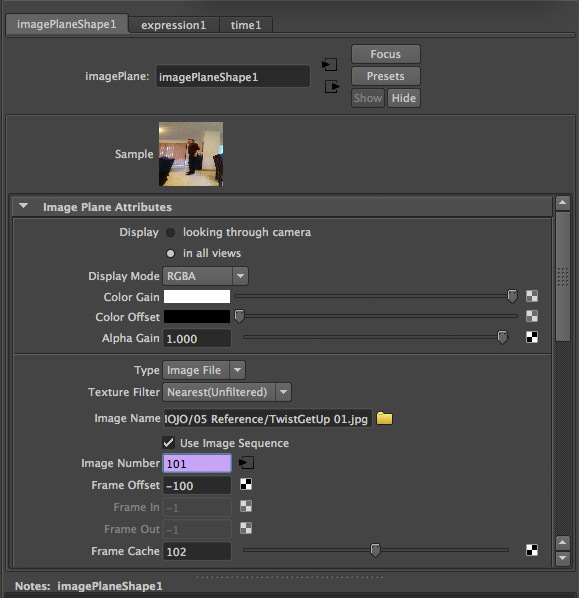 Second, select your camera, open the Attribute Editor and adjust the settings under Display Options > 2D Pan/Zoom. Simply clicking the 2D Pan/Zoom icon in your Viewport will now let you flick between your normal camera set up and a close up view. Update: Thanks to Iestyn in the comments for this tip! If you really want to speed up your workflow, the ‘ \ ‘ key is the hotkey for 2d pan, if you hold it down (instead of the ‘alt’ key) you can use it to navigate, zoom in & out, pan etc with the normal mouse buttons. At work I almost always animate with just my character Isolate Selected in the viewport, just for getting better playback speeds and for clarity without having to set up layers in every scene file/unload references. I’ve combined a few different scripts found online into one to make the process isolating a characters much quicker. Basically all I have to do is select one of the main controls (COG, Root, Head, Spine, IK hands), run the script and that character will now be Isolate Selected in the current viewport. The script includes a switch to turn the Isolate Select on/off and also works for all the Animation Mentor rigs I’ve tried. 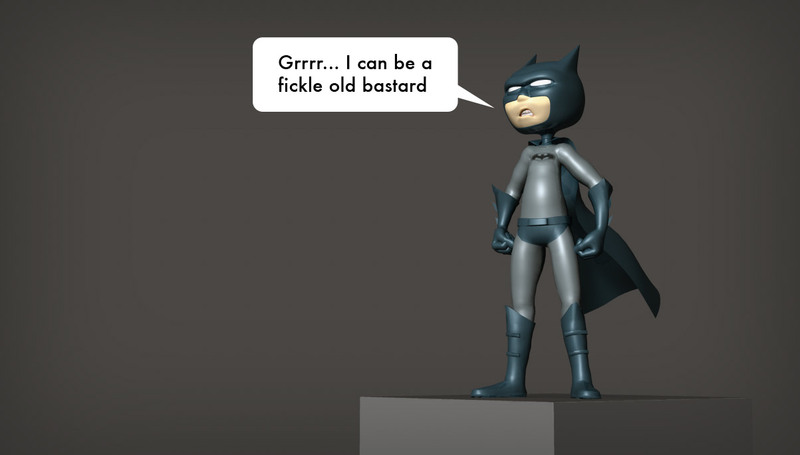 This entry was posted in Maya tips on May 30, 2015 by Tim. This is a simple script/keyboard shortcut I use daily, when setting up my work computer I couldn’t find it anywhere else online so am sharing it here. All it does is change the playback range of your timeline. In a similar fashion to QuicktimePro, pressing “i” will change the playback range to start on the current frame, pressing “o” will make it end on the current frame. It doesn’t affect the length of your timeline, just what section will be played. It’s much quicker than dragging Time Slider or entering frame numbers. 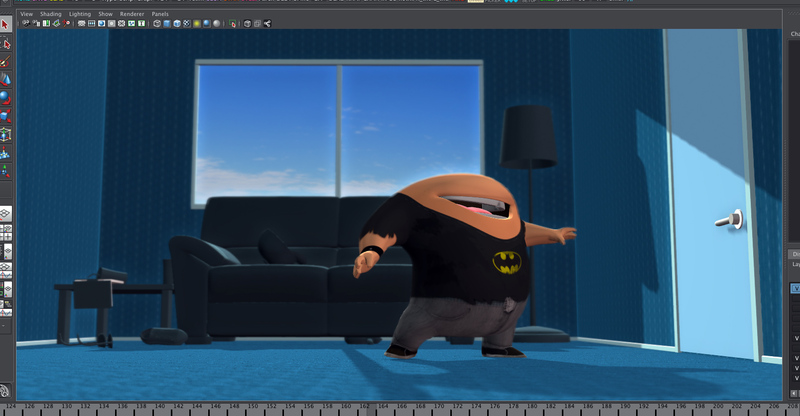 This entry was posted in Maya tips on May 9, 2015 by Tim. *Just updated this post from last year so decided to bring it back to the top of the blog. The A.M G.U.I picker can be a bit of a hassle to work with as it’s quite large and doesn’t allow for shift selecting multiple controls. 2 alternatives I used in A.M are Awe Control Picker and animSelector. Both are easy to set up, take less screen space, allow for controls to be grouped together and also shift selecting multiple controls. While they’re not visual pickers, I have found they are fast to work with. Of the two I now prefer Awe Control Picker, it’s quicker to set up and found I had less hassles with it. It’s also developed by an A.M alumn who continues to improve on it. 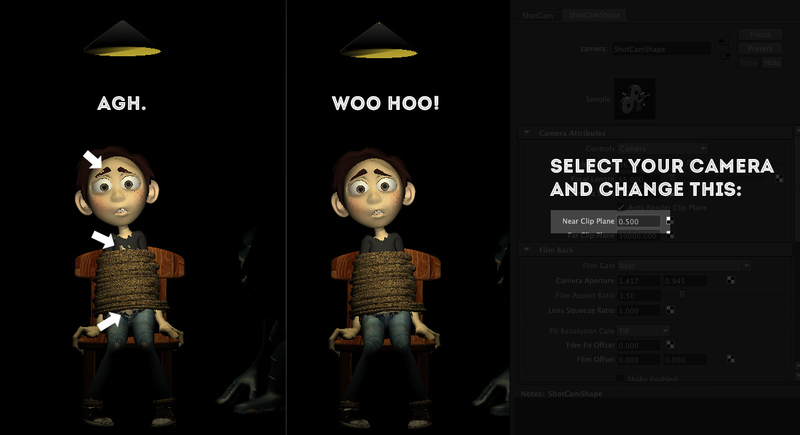 In addition to those two, AnimSchool offers a G.U.I Picker. It’s resizable, has the ability to zoom, is easy to set up and allows for selection sets and shift selecting. 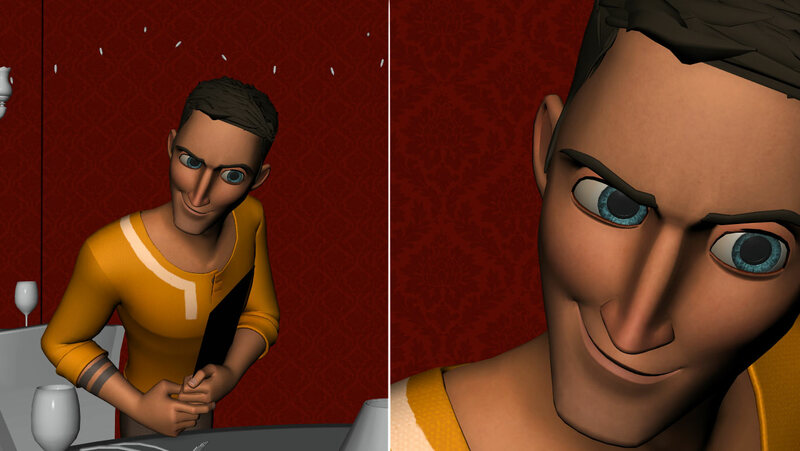 The only downside is that the Terms & Conditions prohibit the use of the picker with rigs from other animation schools. One other tool worth mentioning while on the topic is the Studio Library. It’s a pose library that is easy to set up and great if you use the same rig over many classes/shots (thus building a useful library over time). 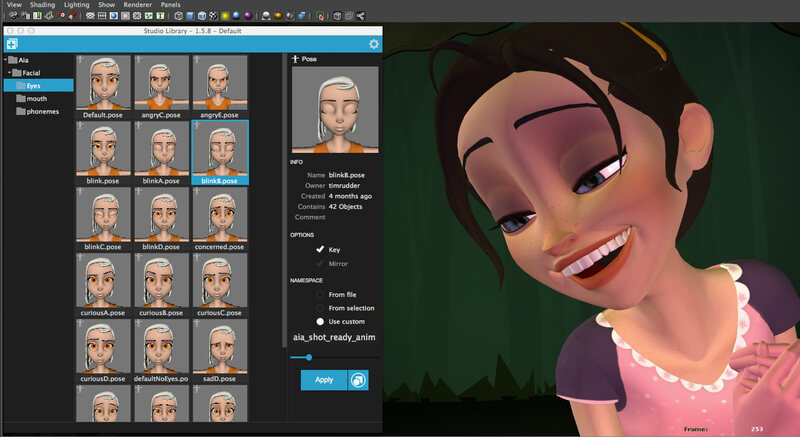 It’s also useful if you have many shots and need to hook up poses between them, if you work in a team and want share poses/animation cycles or like using pre-made phonemes when doing lip sync. 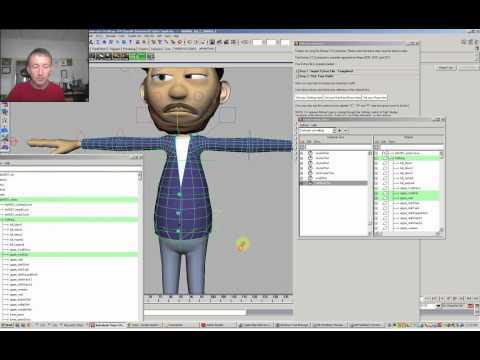 This entry was posted in Maya tips and tagged Control picker, Control selector, GUI, workflow on October 3, 2013 by Tim. My most asked question from this blog is how I light and render my shots. 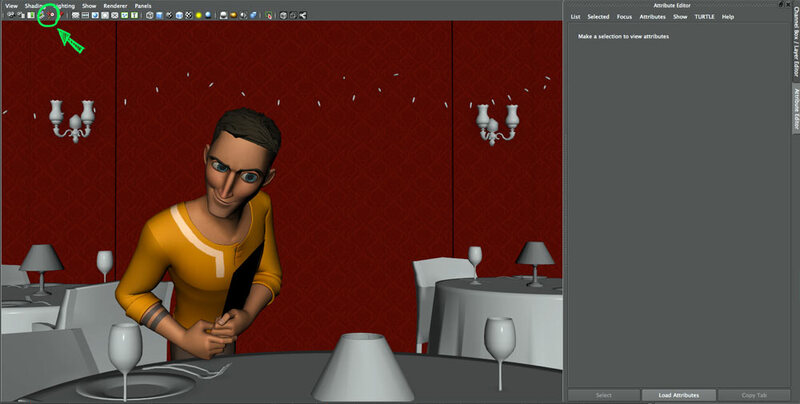 My basic answer is I don’t render anymore, and I start with a simple 3 point lighting set up. To “render” I simply do a playblast. The quality isn’t as good as a render, but it allows me to easily touch up shots and continually update my reel. As an animator I think that’s more important than render quality. I’ll use a more simple example to give a quick run down of how I light my shots. 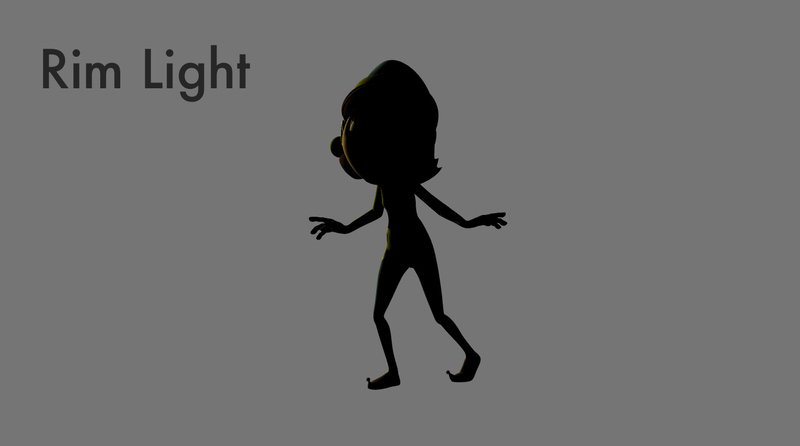 I should note there should be a ground plane so the character casts a shadow, see my edit below for turning on shadows. 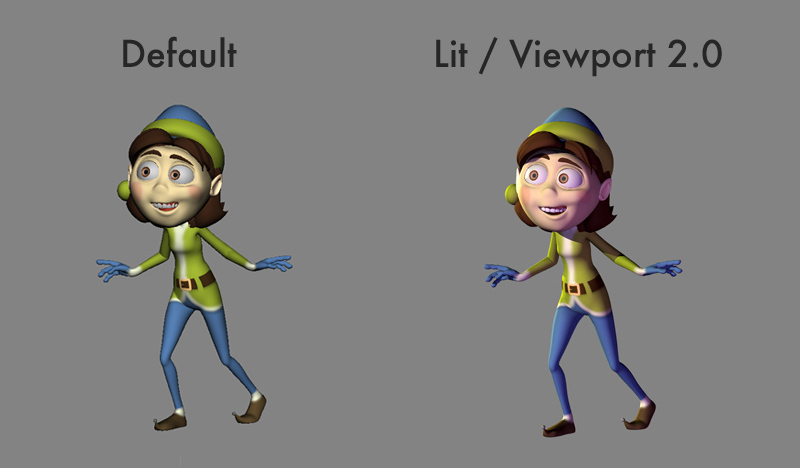 Firstly Switch to Viewport 2.0. I generally turn the anti-aliasing values up to their highest. I don’t recommend actually animating in Viewport 2.0, it’s more intensive and can be quite buggy at times. This is a view of my lighting set up. Here I’ve used Directional Lights as it’s a such a simple set up, when lighting a more complex scene Spot Lights might often be a better choice. If I just reduce the scene to one light, it should get an idea of what each light is doing. 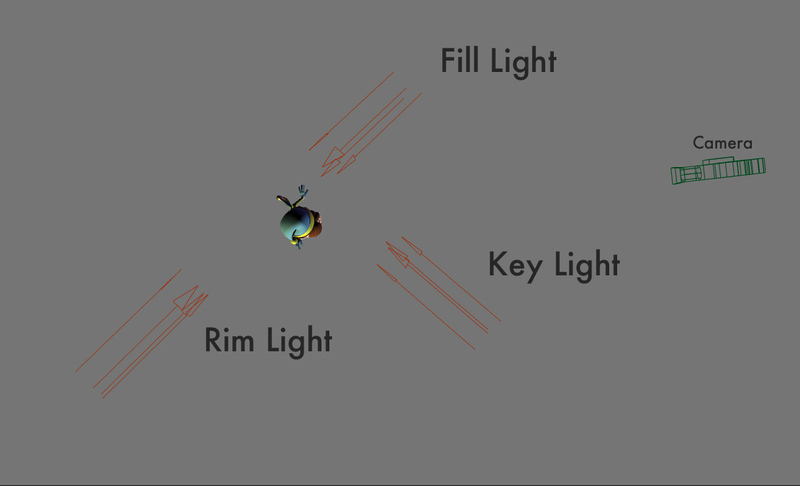 Key Light = the main light source. Fill light brings some detail into the shadows, you can see here I like to add a fair bit of colour to it. 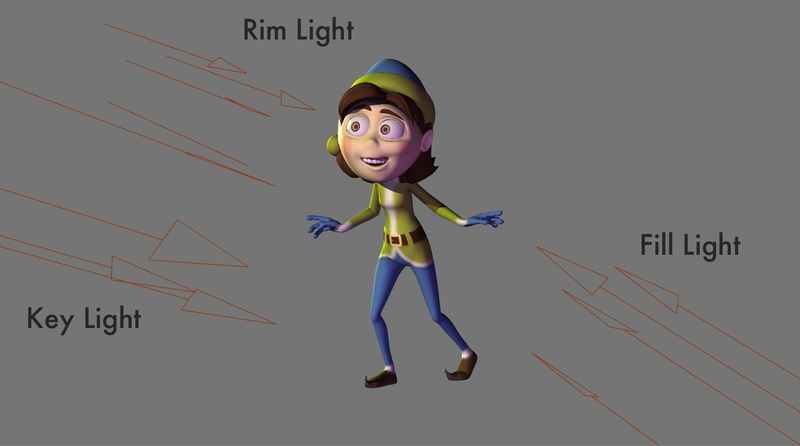 The rim light just helps separate the character from the background. It’s just a subtle touch. The combination of all 3 lights should give a good starting point to your lighting set up. 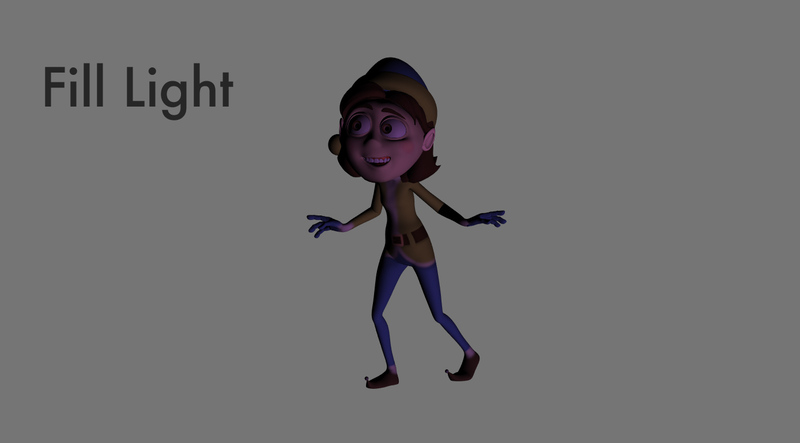 To turn on shadows you need to do it both in your viewport and on the light you want to be casting shadows. 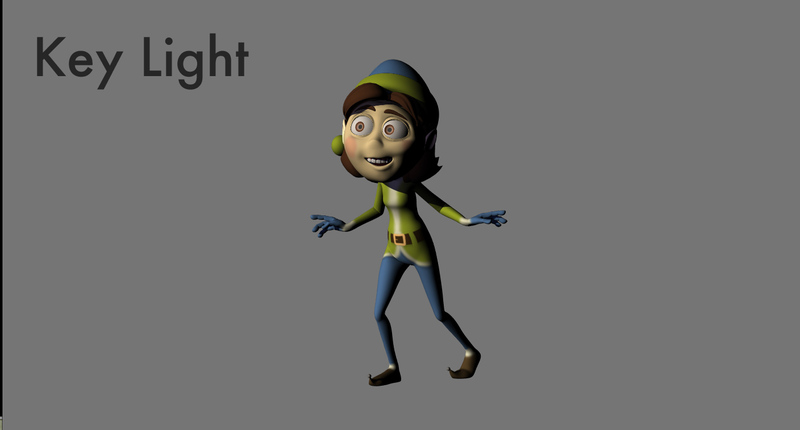 This entry was posted in Maya tips and tagged lighting, maya on May 6, 2014 by Tim. This is an incredibly simple thing, but something I use almost everyday. The code will set a key and make the tick in your timeline green instead of red. 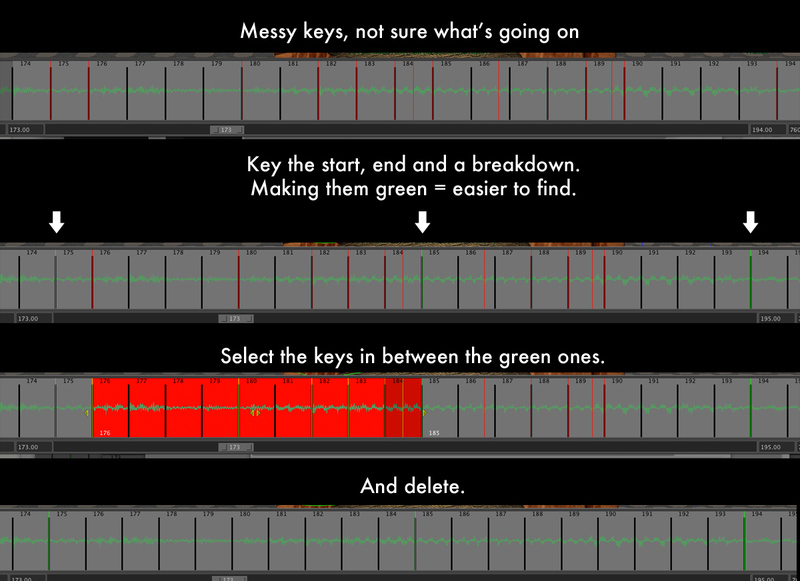 – Making my keys (or golden poses) green, so I can easily differentiate between keys and breakdowns. 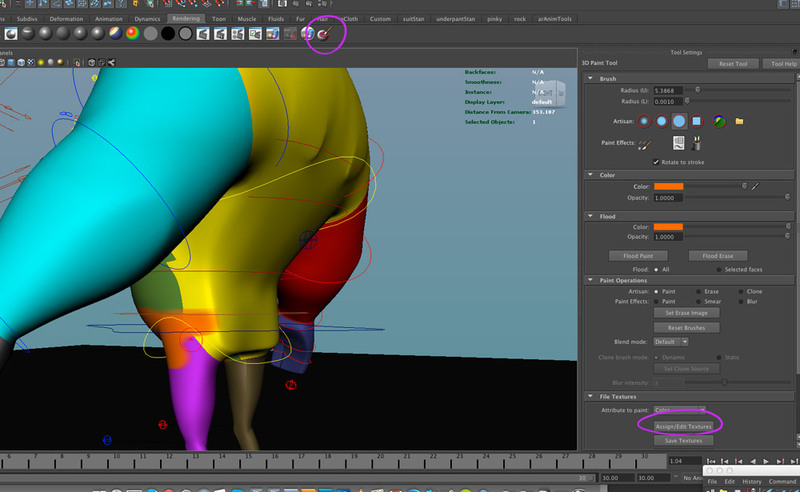 – It’s also great when you’re past the blocking stage and want to either clean up or re-do parts of your animation. I’ve posted an example below. To change back to red you can just individually key the frames again and they will automatically switch. Otherwise using this script should change all the ticks on the selected item back to red. 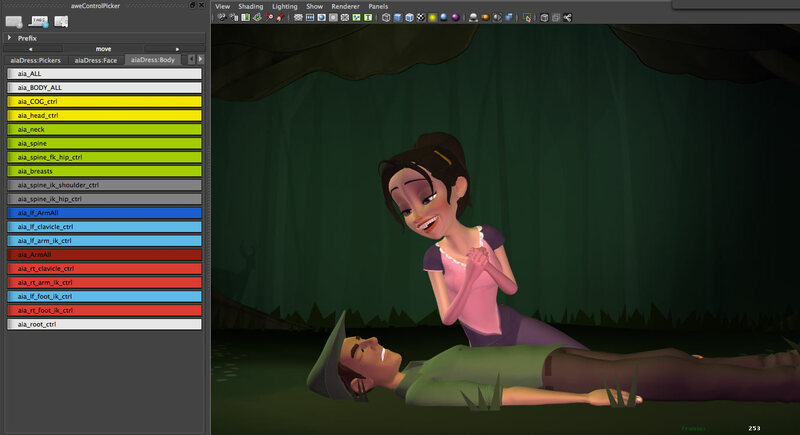 This entry was posted in Maya tips and tagged colour, green, maya, MEL, polishing, timeline on April 5, 2014 by Tim. Or you can simply hold down Ctrl or Shift while dragging. Ctrl will increase the sensitivity, Shift will decrease it. With the default controller you have to select the hand, scroll through the channel box, find the joint you’re after, middle mouse click, drag.. arrgh! Luckily though you can switch to FK fingers and make the process much simpler. Select the root layout controller, press your right arrow key and you’ll see a bunch of extra attributes. 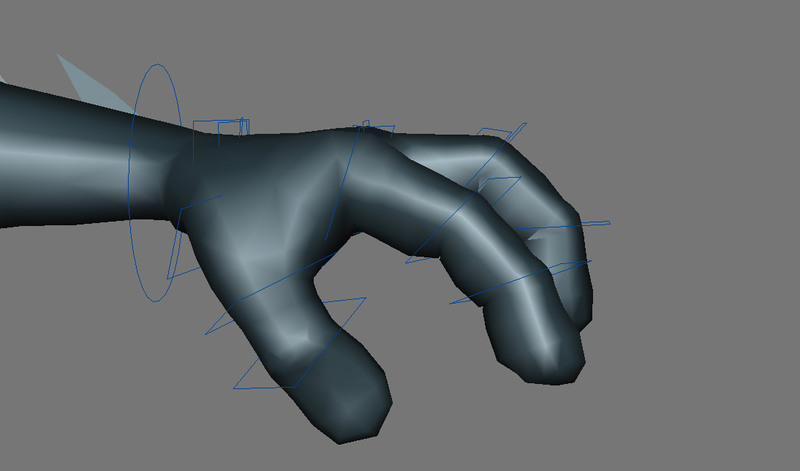 Set FKfinger to Curve. I’ve gone through and delete all the peaks off the pyramid shaped curves, so I’m left with cleaner looking squares. If you want to make the body selectable, follow the same steps and change Geo Display to normal. For my shot I want to have more control over the teeth than the rig affords me. You can easily go into the rig and unlock teeth or the eyes so you have full control over them. 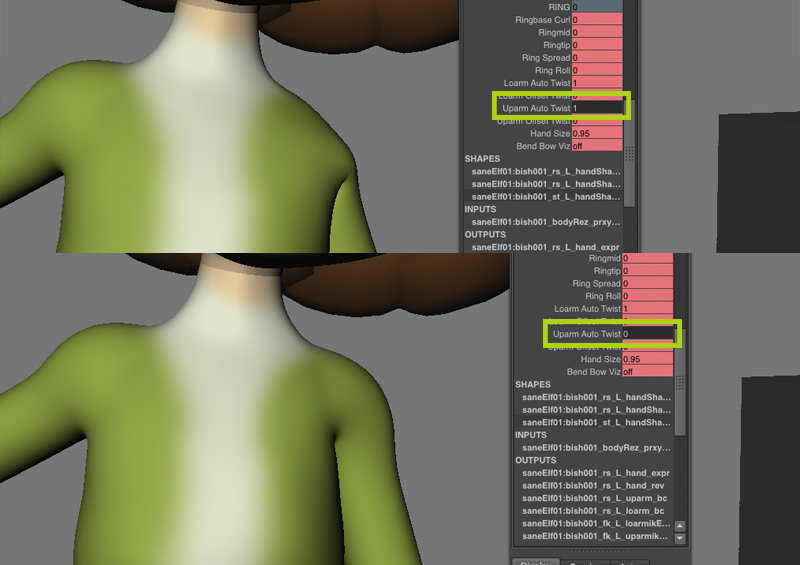 First find them in the Outliner and then in the Attribute Editor change the Drawing Overrides to Normal. 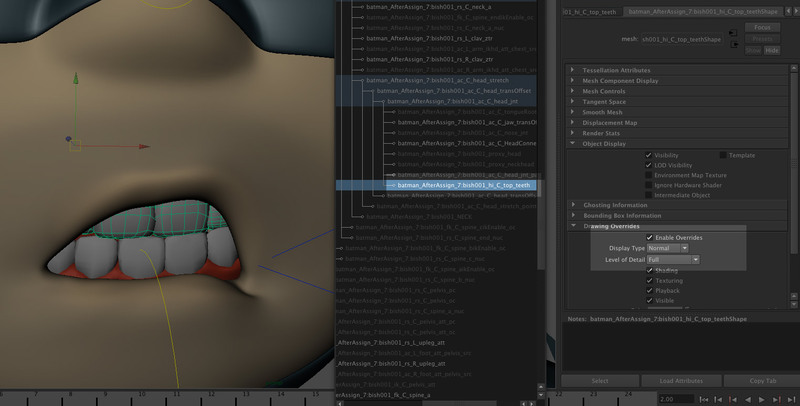 Your teeth should now be selectable in the viewport. For the eyes you’ll need to unlock the attributes just by right clicking in the Channel Box. 2 great vids on modifying Bishop by Jack Parry. I found for the first video, you will need to make sure the Uniform Scale of Bishop is set to 1 (not 6) for it to work. *For my Batman mod I actually used a wrap deformer for his mask. Ditch the A.M GUI, use AnimSelector which I’ve written about here. The way Bishop’s face is set up is quite hard to work with when it comes to splining, too many attributes on the one controller. I created some new controllers to help alleviate the problem, so for example blinks and eye transitions now have their own separate controls. To read more about this check Tomoyo Matsuda’s post here. Noticed this in my shot and also some other shots with Bishop. Pretty simple fix, I usually change the New Clip Plane to something between 0.5 and 1. One of my biggest gripes with this rig is the shoulders. They’re hard to work with, and are very buggy if you use Follow Align. This solution isn’t as simple as it seems in the below image, but it does the job. 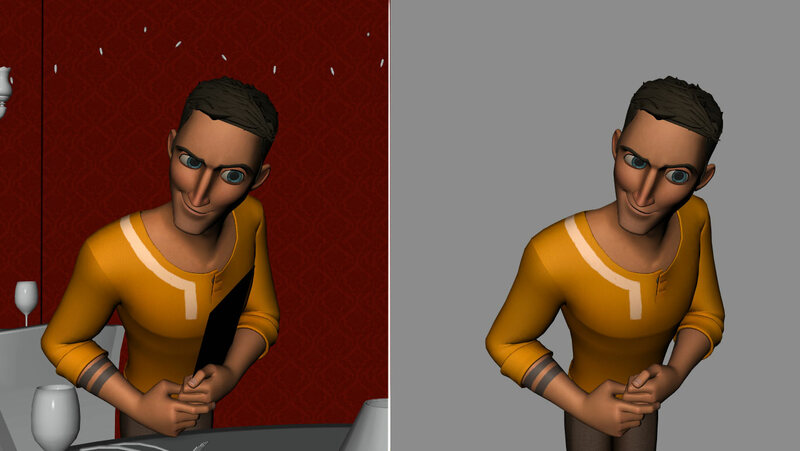 This entry was posted in Maya tips and tagged Bishop, mod, rig on February 15, 2014 by Tim. Tear off a copy of your shot cam and hide your environment. The go into Lighting > Use Selected Lights (with nothing selected). You’ll get an instant silhouette of your character. This just helps me really focus on the key poses. 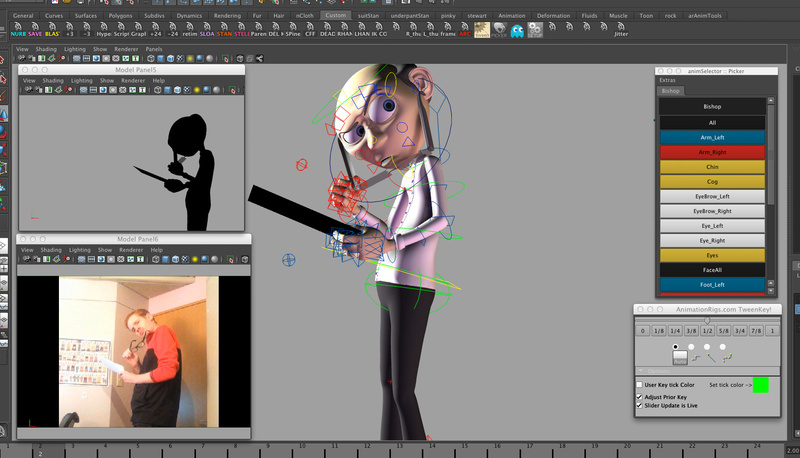 I like to go through my reference/animatic and pull out the key poses in Quicktime Pro. I just copy and paste them into a new quicktime. I’ve taken my current 10 second and reduced it to 4 frames. I then export that as an image sequence, create a new camera in my scene file and import the image sequence as an image plane. I then tear off that camera too. Having nothing but the key poses stacked over the first few frames just simplifies things a lot and I focus entirely on those 4 poses before moving on. It’s a good idea to save the file as a mov as well, that you can easily add more keys and breakdowns later down the track. This entry was posted in Animation tips, Maya tips and tagged blocking, posing, reference vid, silhouette on November 2, 2013 by Tim. If you open the texture file you’ll see something like this. Save another version with a new filename. I tend to work with Tiff to retain layers, though I’m sure somebody will tell me why Targa is a better filetype. If you open up your reference file of any of the characters, go into the Window > Rendering Editors > Hypershade and go into Textures. 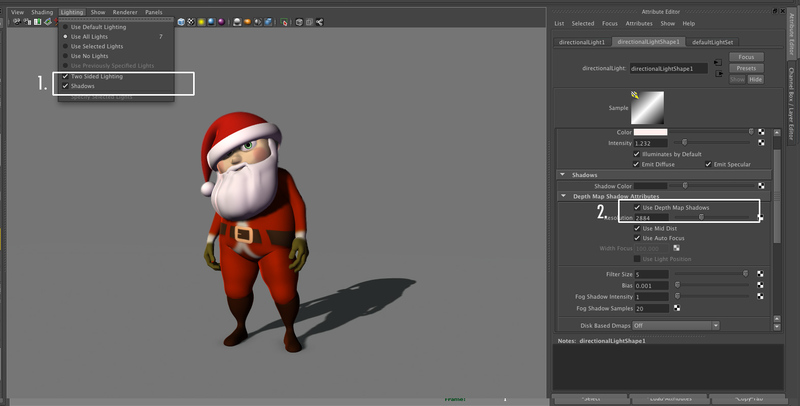 You should see anim_color_MAP(file) (this may be a different name for other characters). Click on that and in the attribute editor you should see Image Name under File Attributes. Click the small folder, find your new texture map and load that in. 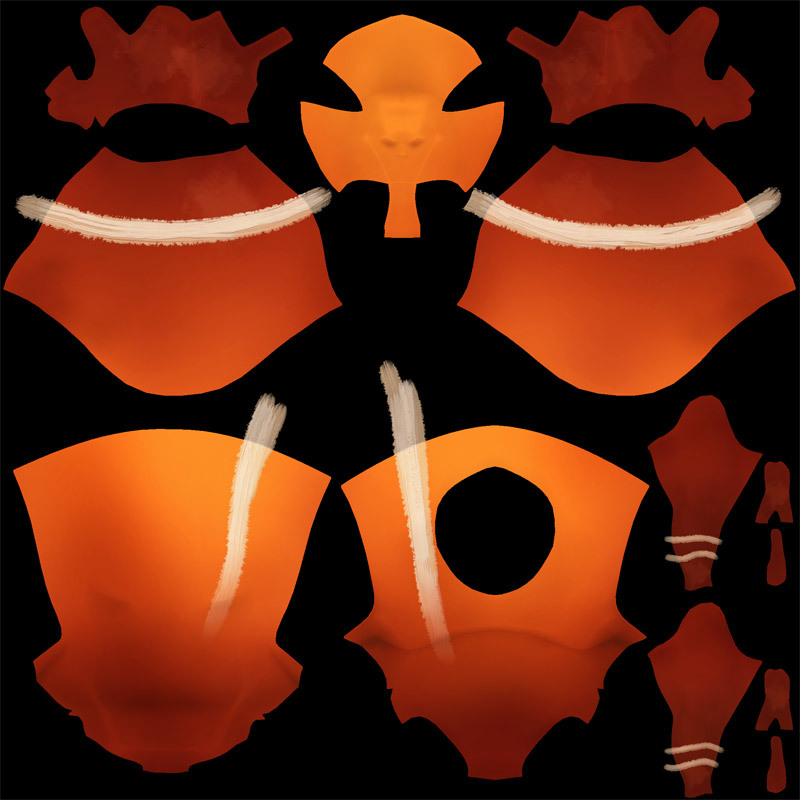 In the texture map each area corresponds to a different area of the body. If I change it to simple colours you should be able to see what area of the texture map applies to which part of the rig. The red area is the right arm, the green is the torso, etc. A good way to get a general guide of where things will be on the texture map is to use the 3D Paint Tool. You can basically roughly paint on the mesh and then clean it up in Photoshop. 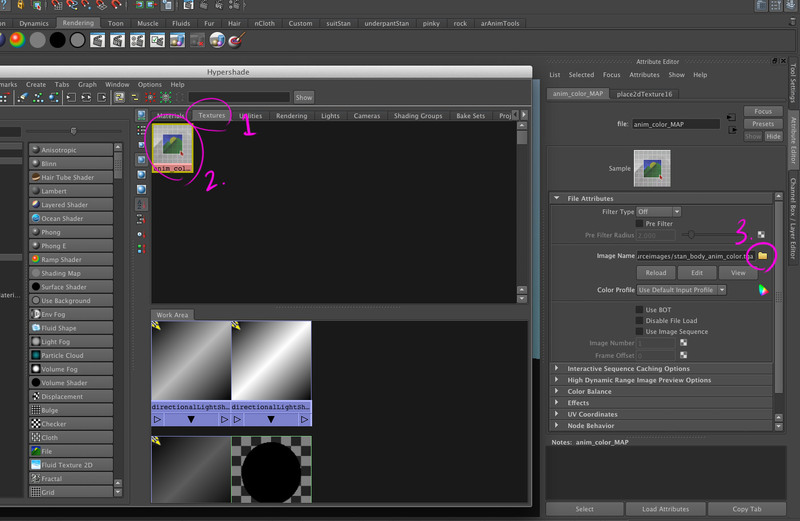 Select your mesh first then, go into your Rendering shelf click the 3D Paint Tool icon (should be the last one). Next, in the Attribute Editor click Assign/Edit Textures. Now you should be able to freely paint on the mesh. When you’ve got a rough idea painted, hit the Save Textures button in the Attribute Editor. In your project’s Source Images folder, you should have a new 3DPaintTextures folder with the the new texture map inside. Using this you can now make a cleaner final version in Photoshop. 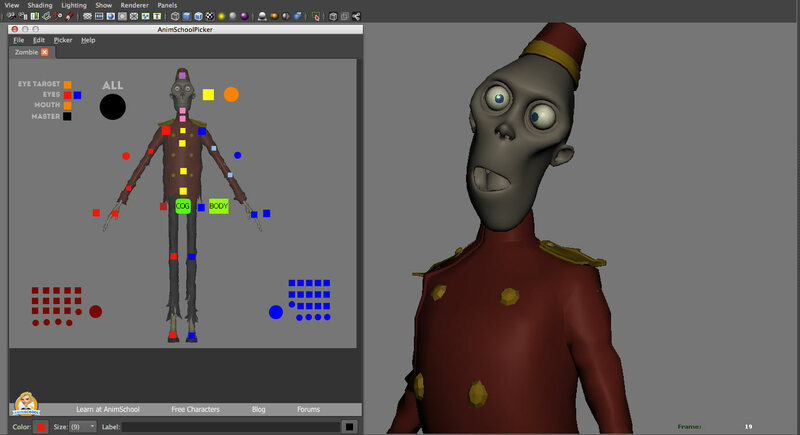 This entry was posted in Maya tips and tagged animation mentor, Imps, Rigs, Stan, Texture on August 29, 2013 by Tim.